Understanding these Macbeth quotes will make you the envy of the class. Quote: If I had died but an hour before this chance, / I had lived a blessed time; for, from this instant, / There’s nothing serious in mortality: / All is but toys: renown and grace is dead; / The wine of life is drawn, and the mere lees / Is left this vault to brag of . (Act II, scene III). Analysis: Enjoy this fine example of verbal irony: the hearers assume Macbeth’s lamentation is caused by the death of the king; Macbeth actually speaks of his murdering of the king. In this passage, Macbeth expresses his guilt over what he has done, a guilt which he sheds as the play progresses and Macbeth orders the murders of Banquo and Macduff’s family. Analysis: Malcolm’s description of the thane of Cawdor’s execution for treason foreshadows the death of the new thane of Cawdor, Macbeth. Quote: I have no spur / To prick the sides of my intent, but only / Vaulting ambition, which o’erleaps itself / And falls on the other. (I, vii). Analysis: In an attempt to get psyched up for the murder of Duncan, Macbeth concludes that he has no real reason to kill the king, other than his own ambition to become king. The results of this action demonstrates the dangers of unchecked ambition. If you thought the ladies liked you before, just wait until you explain these Macbeth quotes. Analysis: Macbeth says this to himself after murdering Duncan. His guilt causes him to shake at every noise. His hands symbolize the murder. Neptune is an allusion to the Roman god of the sea, whose waters could not wipe the blood–meaning guilt–from Macbeth’s hands. In case you’re wondering, incarnadine means a pinkish, reddish color similar to the color of flesh or blood, the same color as the seas if Macbeth were to wash his hands in them. The entire passage exemplifies hyperbole and demonstrates the extent of Macbeth’s guilt, a guilt which he no longer feels after the murders of Banquo and Macduff’s family. Analysis: This line in act V is spoken by Lady Macbeth as she sleepwalks and is an outward manifestation of her inward guilt. After the murder of Duncan, Lady Macbeth chides Macbeth for his lack of masculinity and tells him to forget the deed and move forward as king. 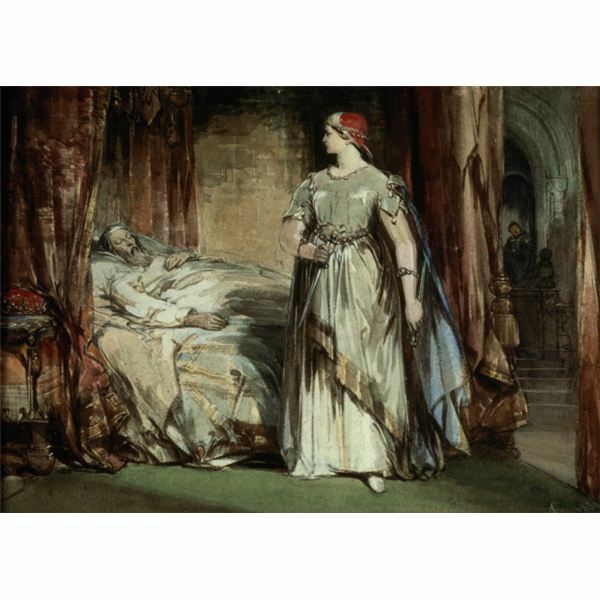 As the play continues and Macbeth loses all feeling of remorse for his treacherous deeds, Lady Macbeth begins to feel guilt for her role in the deaths of Banquo and Macduff’s family. Quote: Is this a dagger which I see before me, / The handle toward my hand? Come, let me clutch thee; / I have thee not, and yet I see thee still. / Art thou not, fatal vision, sensible / To feeling as to sight? or art thou but / A dagger of the mind, a false creation, / Proceeding from the heat-oppressed brain? / I see thee yet, in form as palpable / As this which now I draw. (II, i). Analysis: It is clear that Macbeth is insane. He sees witches on the moor. He sees a dagger in mid air that mocks him moments before killing the king. 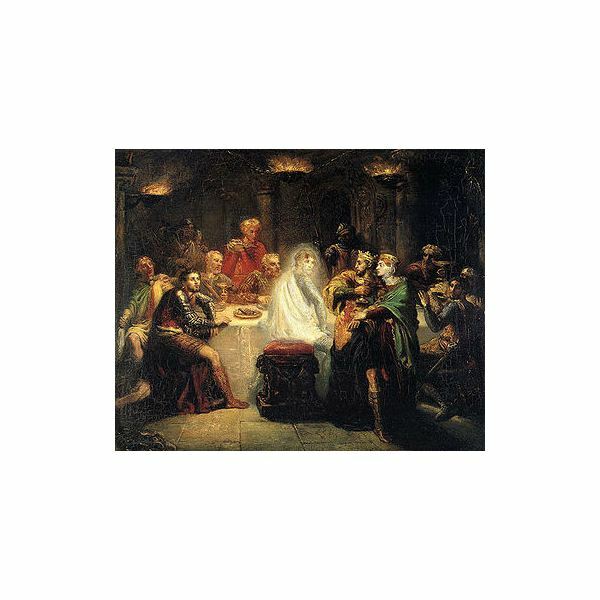 He sees Banquo’s ghost sitting in his spot at the dinner table. Shakespeare puts in a nice pun with “A dagger of the mind.” The dagger may also symbolize the throne itself: Macbeth sees it, yet cannot grasp it; when the dagger is grasped so is the throne. The grasping of both does not bring the desired happiness. I suppose if these famous quotes from Macbeth were really famous, we wouldn’t have to Google search them? Quote: Double, double toil and trouble; / Fire burn, and caldron bubble. / Fillet of a fenny snake, / In the caldron boil and bake; / Eye of newt, and toe of frog, / Wool of bat, and tongue of dog, / Adder’s fork, and blind-worm’s sting, / Lizard’s leg, and owlet’s wing,— / For a charm of powerful trouble, / Like a hell-broth boil and bubble. / Double, double toil and trouble; / Fire burn, and caldron bubble. (IV, i). One reason Shakespeare includes witches in the play was to please King James I, who had just written a book on how to detect witches and for whom the play was initially performed. Outraged witches (I swear I’m not making this up) cursed the play for its divulgence of witchcraft secrecy. Any individual uttering the word "Macbeth" (not including those who speak it as a line in the play) bring bad luck to the play and those in the theater unless, of course, they exit the theater and spin around three times while yelling profanity. Quote: Fair is foul and foul is fair. (I, i). Analysis: The opening scene establishes the play’s mood and one of its main themes: things are not as they seem, a theme evidenced by the false sense of security enjoyed by the play’s soon to be killed characters. Who determines what exactly makes a famous quote from Macbeth famous? I think it’s you and I.
Quote: Come, you spirits / That tend on mortal thoughts! unsex me here, / And fill me from the crown to the toe top full / Of direst cruelty; / make thick my blood, / Stop up the access and passage to remorse, / That no compunctious visitings of nature / Shake my fell purpose. (I, iv). Analysis: Lady Macbeth calls forth her unladylike qualities to buoy her desires to rid Scotland of Duncan and have her husband crowned king. Analysis: When three witches chanting around a cauldron announce your arrival in this manner, you’ve probably made a bad decision at some point in your life. This is exactly how the witches announce the coming of Macbeth. Something Wicked this Way Comes is also the title of a novel by Ray Bradbury. Quote: And all our yesterdays have lighted fools / The way to dusty death. Out, out, brief candle! / Life’s but a walking shadow, a poor player / That struts and frets his hour upon the stage / And then is heard no more: it is a tale / Told by an idiot, full of sound and fury, / Signifying nothing. (V, v). Analysis: Macbeth describes life immediately after hearing about the death of Lady Macbeth through the use of an extended metaphor. According to Macbeth life is a path leading to death, a brief candle, marked by the shadow of death, a bad actor who is heard from never again after leaving the stage, and a story teller who yells his meaningless tale. Not exactly the optimistic comparison you were hoping for? Keep in mind that this description of life comes from a man who has just lost his wife, who is guilty of murdering several people, and is under attack by an army of 10,000 men. You’d probably be depressed too. The title of William Faulkner’s The Sound and the Fury is a direct allusion to this passage.